The most predictable major spectator event in New York City is set for Thursday ... shortly after 11:59 pm. The New Year's celebration in New York's Times Square will be watched on TV around the world. The celebration has been going on for more than a century, and the famous Times Square ball made its debut on December 31, 1907. 1 million: The number of people expected to jam into Times Square to see the celebration this year. $0: How much it costs to attend the event. All you have to do is get there early enough to find space on the street. Restaurants and hotels in the Times Square area are no bargain. Getting into the Olive Garden party will cost $400. 100 million: What organizers expect as U.S. television viewership. That is nearly as much as the record 114.4 million viewers who watched the most recent Super Bowl. Estimates for worldwide viewership of the Times Square celebration stand at more than 1 billion. 6,000+: Number of New York Police Department officers on duty in the Times Square area. Of those, 1,200 will be new officers who just graduated from the police academy. 7: Number of different versions of lighted balls that have been used over the years. The first one was made of iron and wood, weighed 700 pounds and was covered with 100 light bulbs. The current one made its debut in 2008. 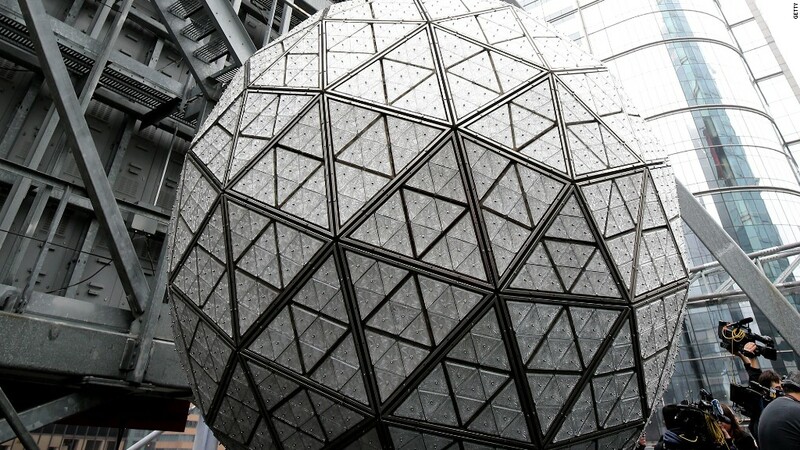 11,875 pounds: Weight of current New Year's Eve ball. It is covered with 2,688 Waterford Crystal triangles of varying sizes. The ball is 12 feet in diameter. 32,256: Number of LED lights attached to the ball. Together they can display 16 million different colors and billions of patterns.